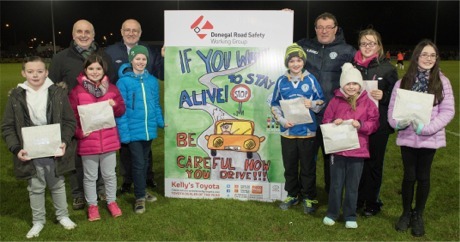 FINN Harps Football Club and the Donegal Road Safety Working Group have announced the winners in their recent Primary School Road Safety Art competition. The competition was open to all primary schools in the county and attracted over 650 entries. The winning drawing was submitted by Cian O’Hagan from Scoil an Linbh Iosa, Carrigans. His winning art work features the message: "If you want to stay alive, be careful how you drive!". It will feature as an advertising hoarding in Finn Park for the 2016 season. Winner and runners up in the Donegal Road Safety Art Competition pictured with Brian O’Donnell, Fran Gavin FAI and John Campbell, Finn Harps. From left are Bailey Coyle Mitchell, Ciara Sayers Montgomery, ovrerall winner Cian O’Hagan and his poster, Daniel McCallion, Aibhe McMenamin, Niamh Jones and Maggie Gallagher. The presentation of prizes took place at Finn Harps' first home game of the new premier season against Derry City at a packed Finn Park. Finn Harps won the game 2 -1 and all the winners present had a great evening as guests of the home side. Daniel McCallion, St.Mura’s N.S., Tooban, Burnfoot. Ciara Sayers Montgomery, Ballymore N.S., Portnablagh. Bailey Coyle Mitchell, St.Baithin’s N.S., St.Johnston. Aibhe McMenamin, Scoil an Choimin, Cloghan. Niamh Jones, St.Peter’s N.S., Mountcharles. Maggie Gallagher, Scoil na Léibe, Aranmore Island.